I love easing open a jar of my favorite pre-made face mask as much as the next spare-time-starved woman. However, when I have an extra half an hour on a Saturday morning and a beautiful papaya sitting on my counter, I become little miss where’s-my-apron? and find myself poking through the cupboards and the refrigerator to see what ingredients I have on hand that I can mix into a treat for my skin. 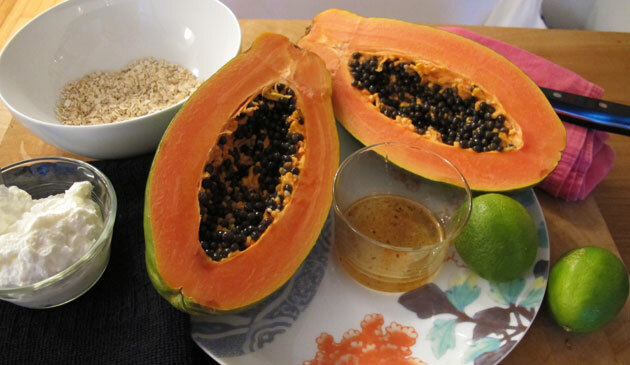 The papaya I used that’s pictured here sat for a day or two too long, based on the fact that a just underripe papaya has stronger alpha-hydroxy acids and higher levels of papain – which is an enzyme that can dissolve dead skin cells – than a ripe one. I let this one go a little longer because I knew I wanted to eat it just as much as I wanted to turn it into a beauty product. I added greek yogurt (although you can use any type) because I like how it makes the whole concoction a little more thick, which allows it adhere to your skin a little better. The honey acts as a humectant and helps the skin retain moisture. Despite my papaya being a bit too ripe, I still felt the slight tingle when I put it on my face which told me it was working! it was working! I have super sensitive skin, as my friends know – because I’m constantly having a reaction to some new product I’m testing – but this mask never leaves me splotchy or itchy. If you suspect that you have an allergy to any one of the ingredients DO NOT USE THEM! I use organic rolled oats (same ones I eat for breakfast most mornings) and put them in a little food processor for a few seconds to make them into a fine powder. Oats are a long time favorite soothing remedy for sensitive, irritated skin, and work in this mask to gently exfoliate as well, lifting off the dead cells the papaya enzymes loosened. Please note: it’s important to never actually scrub your face with anything. No amount of scrubbing will get your skin deep down clean, and will instead potentially damage skins cells and create raw, irritated skin which may kick oil production into overdrive (skin’s natural defense to soothe and heal). Nothing more intense than a gentle circular motion should ever happen to the skin on your face. There are many variations within this recipe, as well as so many great kitchen basics you could add to it including fresh (but not hot) unflavored coffee grinds to exfoliate as well as tighten and brighten (caffeine is in so many anti-aging creams these days), and apple cider vinegar, which acts as an astringent and has been shown to bust its way into clogged pores. A little more than 1 quarter of the meat from 1 papaya, seeds scraped away, cut into cubes and either mashed with a fork (much easier when it’s more ripe) or pulsed into a chunky mess in the cuisinart. I mixed it all in a mini food processor, added in this order, for a few seconds and then put a delicious, cool, thick layer on my face. Thirty minutes later I washed it off and marveled at my glowing, fresh skin. There are so many more do-it-yourself face masks that I love. I’ll post more soon.